Three leading sustainability investment firms said they filed shareholder resolutions at Target and Best Buy seeking to have independent board members review the companies’ political contributions and spending processes. The two national retailers, both headquartered in Minnesota, have been under fire since the disclosure last month of their political contributions to an organization that backs a state gubernatorial candidate who opposes gay marriage. Target has contributed $150,000 and Best Buy $100,000 to MN Forward, an independent expenditure committee that has taken out ads in support of Tom Emmer, a Republican state lawmaker. The contributions have drawn widespread media coverage and criticism from customers and organizations such as Human Rights Campaign, a national advocacy group for lesbian, gay, bisexual and transgender (LGBT) rights. Investment firms Walden Asset Management, Trillium Asset Management Corporation and Calvert Asset Management Company, Inc. said they joined together to file a proposal at Target Corporation that asks the company’s independent board members to undertake a “comprehensive review of Target’s political contributions and spending processes including the criteria used for such contributions” and “oversight processes by management and the Board.” Calvert and Trillium have filed a similar resolution at Best Buy, Trillium on behalf of the Equity Foundation, which works to eradicate prejudice towards the sexual and gender minority communities of Oregon. Collectively, the firms said they control more than 1.1 million shares of common stock in Target worth $57.5 million, and 344,000 shares of Best Buy worth $11.3 million. Target and Best Buy have both previously stated that their contributions were aimed at supporting candidates whom they felt would foster economic growth in Minnesota. Target has since issued apologetic statements directed toward employees and customers. 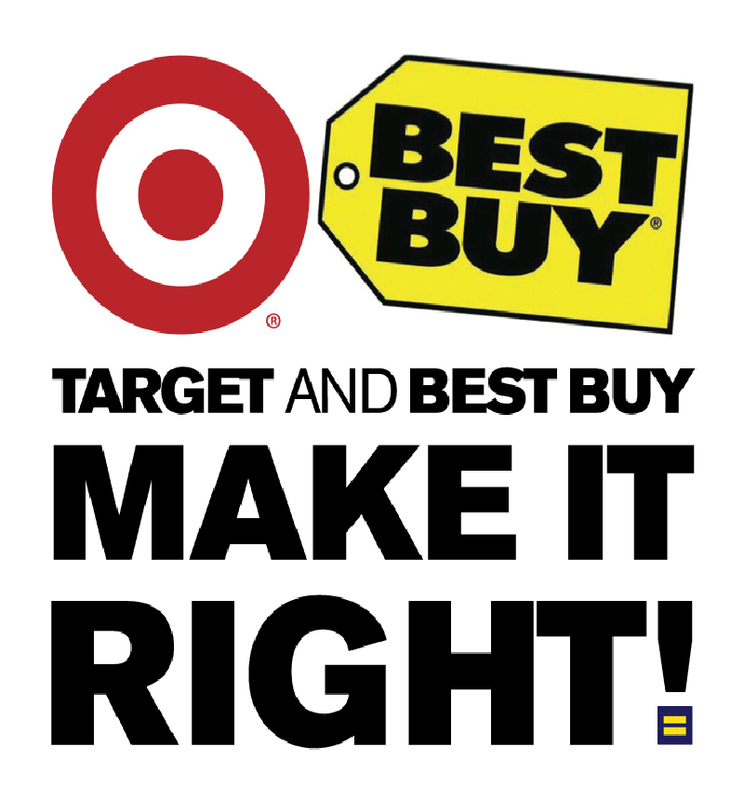 Human Rights Campaign has sought to have Target and Best Buy make contributions to groups supporting gay-rights candidates in Minnesota. However, “after two weeks of good-faith discussions – and two tentative agreements,” the organization said this week, Target has declined “to take corrective action.” Discussions with Best Buy continue, according to Human Right Campaign. The controversy involving Target and Best Buy is the most high-profile since the U.S. Supreme Court’s decision last January in Citizens United, which gave corporations and unions new freedom to support political candidates through contributions to Independent expenditure committees. Moveon.org, the national advocacy group, has announced an effort to organize boycotts of Target and Best Buy.